Designed to revive the art of conversation, TAOC is a fabulous way to make dinner parties, barbecues, holiday occasions and all get-togethers memorable. 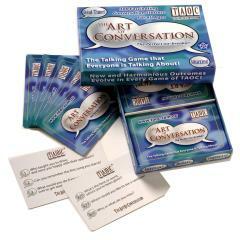 With 300 fascinating and conversation building questions, plus 20 blank cards on which to write your own TAOC questions, this game is for everyone. TAOC is suitable for all ages. The only knowledge needed to successfully contribute to TAOC is your own life experiences, interests and ideas. TAOC may be used hundreds of times with continuing interest and pleasure. Each time TAOC is used, new and harmonious outcomes evolve.